Last weekend I visited Paris and I discovered Velib, a city wide bicycle scheme. I thought this city planned access to bicycles is a fantastic way to tour Paris. I also came across a cycling scheme in Barcelona called Bicing. Unfortunately I couldn’t figure it out how to rent a bike. Which leads me back to Velib. It was quite complicated to work out as a tourist to get a short term one day hire with a 150EUR deposit. Their system works, but it was fairly convoluted. 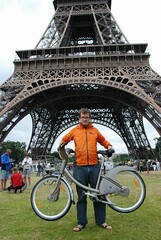 Informed by my CTC newsletter, Velib celebrated its first birthday on 15th July. A lengthy PDF document is linked by CTC exploring the myths of Velib. I made a copy of the Velib PDF too. Now for my comments. The bike design is excellent. 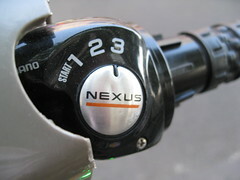 Velib bicycles use a Revo-shift Lever and Bell Crank (SL-3S35-E) from Shimano. A hub gear solution that’s very reliable and easy to maintain. I chose this very configuration with my Helkama bicycle. 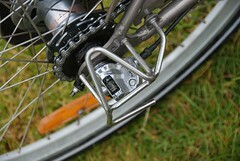 This is a very good idea as I damaged my “bell crank” whilst wrenching it out of a bike holder on a train to Guildford. The bell crank once damaged kept falling off and I had to get the boys at Halfords (their 15GBP a year bike care plan is amazing good value) to retap the bolt to fix it. The free tourist maps from the metro do not show Velib locations which is a sin. Anyway, well done to the French. Velib is definitely the best example of a successful alternative city transport scheme.